The map of the United States is a battlefield. 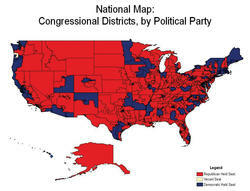 But instead of combat zones, there are 435 Congressional districts. Instead of air strikes, there are TV ad buys. Instead of ammunition factories, there are fundraisers. And instead of enemies, there are Republicans. Robby Mook ’02 views the 50 states in those stark terms as the executive director for the Democratic Congressional Campaign Committee (DCCC). Ap­pointed in December 2010, he has a clear mission: wrest away at least 25 Republican-controlled seats this November so the Demo­crats can regain control of the House of Representatives. At 32, Mook is remarkably young for such a high-profile, high-intensity job — but the man who introduced him to the national stage is convinced the fresh-faced political operative is up to the task. “He’s pretty unflappable, and he’s got a good personality for getting the work done. He puts the focus on the job, not himself,” says Howard Dean, the former governor of Vermont — Mook’s home state — who employed Mook in his 2004 presidential bid. The DCCC is the campaign arm of the House Democrats, charged with recruiting candidates, raising funds, researching the opposition and coordinating strategy in close, or politically significant, races. 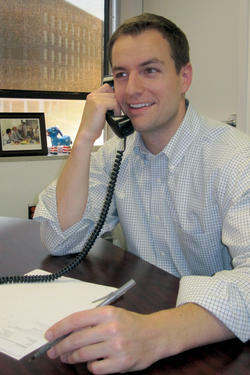 Mook was appointed to the DCCC post 16 years after he caught the political bug. He grew up in Norwich, Vt., a town of just 3,500 that sits along the New Hampshire border. As a high school fresh­man, he joined a production of Imaginary Invalid, which was di­rected by Matt Dunne, whose day job was Vermont state legislator. Mook was hooked. Drawn to the College for its diversity, Mook became a classics major and while he never took a political science class (“Pretty funny, come to think of it,” he says now), campaigning was in his blood. After his freshman year in Morningside Heights, he returned to Vermont and Dunne hired him as the first staffer for the state legislature’s Democratic caucus. Mook moved to Burlington, found a tiny apartment and dove in, going door to door and or­ganizing the first fundraisers many of the legislators ever had. He sharpened his skills back on campus, too, working for the College Democrats and jumpstarting the organization’s first electronic file of voters and volunteers. “That was a level of sophisticated voter-contact that was un­heard of on college campuses in 2000,” says Sam Arora ’03, who worked alongside Mook as an undergraduate. Mook returned home after graduation, working for the state Democratic Party and for Dean, the governor who made such a memorable splash in the 2004 presidential primaries. Mook ran Dean’s New Hampshire campaign and helped coordinate the on­line efforts of a campaign that was among the first to fully use the Internet’s ability to organize supporters. “That was a national campaign very early on. We had to bottle lightning, as we knew there was a lot of energy and excitement in the campaign,” Mook says. Even the campaign’s quick implosion was a teaching moment. Mook then ran a get-out-the-vote effort in Wisconsin for nomi­nee John Kerry and, four years later, took on far more responsi­bility for Hillary Clinton. He ran her primary campaigns in three states — Nevada, Ohio and Indiana — and attracted a legion of loyal followers who dubbed themselves the “Mook Mafia.” The group, a loose collection of staffers who have worked for Mook across the country, frequently meet for drinks and celebrate a bond forged in the political trenches. It’s going to take much of that hard work for the Democrats to win back the House, a challenge that Mook now calls his own. Mook too, is confident. He dismisses the Democrats’ September defeat in New York’s Ninth Congressional District — Anthony Weiner’s former seat — as a unique race that was swayed by local issues. As November approaches, Mook will coordinate a national strategy to raise money and direct it to the candidates who have a chance to unseat Republican in­cumbents, fighting them on issues such as Medicare and tax breaks for big corpo­rations. He’ll oversee it all from his war room in Washington, D.C., a far cry from a tiny town in eastern Vermont. “Like any campaign, we move the majority of our resources late, so we’ll be in constant communication with our rac­es to track progress and help push them over the top,” Mook says. “Election Day itself is always one big contradiction: Ev­erything you’ve been pouring your heart into for two years comes to a finish, but if you’ve done your job right, there’s ab­solutely nothing for you to do except sit and wait for results. Jonathan Lemire ’01 covers politics for the New York Daily News.